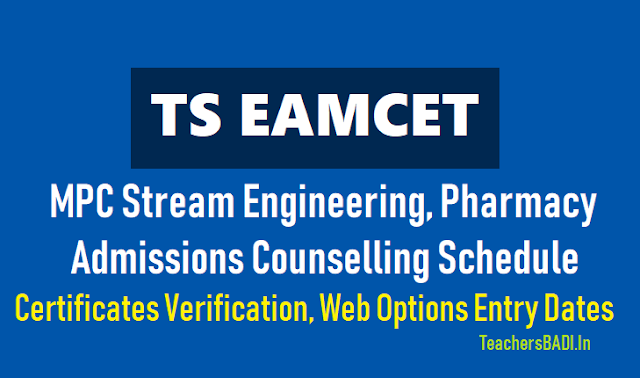 TS EAMCET MPC Stream Engineering, Pharmacy Admissions Counselling final phase 2019 notification: TS EAMCET 2019 final phase admissions 2019 notification released for TS EAMCET Spot Admissions Counselling 2019. 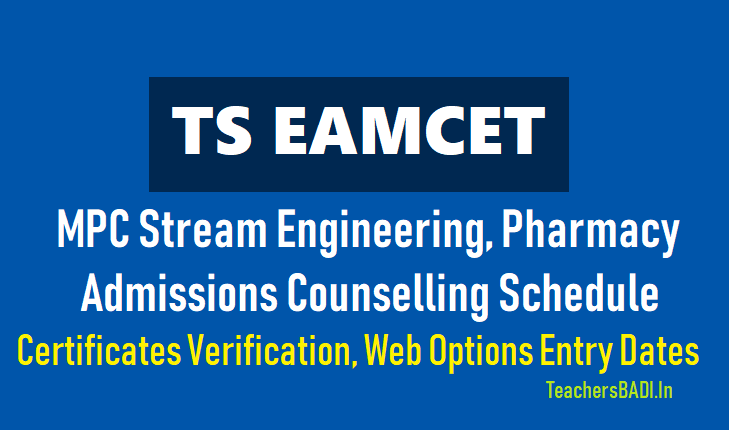 Final Phase TS EAMCET 2019 Web counselling Schedule has been announced for Final Phase TS EAMCET 2019 Certificates verification dates, Final Phase TS EAMCET 2019 Web Options entry dates. The eligible and qualified candidates of TSEAMCET-2019 who have not attended for Certificate Verification earlier shall get their Certificates verified from designated Help Line Centers mentioned in Annexure I. The candidates who have participated in first and second Phases Counselling can also exercise options using their old password, Login ID for the left over seats now available and consequential vacancies that may arise in the process of allotment as per the schedule given below, and it is advised to exercise options for interested Colleges assuming that vacancies are available in the course of their choice. • Who have secured a seat, reported and aspiring for a better option both within the reported college or another college. 1. Options given in the first and second Phases will not be considered for allotment and candidates have to exercise option afresh. 2. Candidates who are satisfied with their previous allotment and paid the Tuition Fee through online and reported at allotted college need not exercise options once again. 4. The candidates those who are not got certificates verified in the first and second phase have to attended for Certificate Verification in any nearest designated Help Line Center given in the Annexure I on the scheduled date. During Certificate Verification, the candidates Aadhar details (Finger Print Biometric) shall be verified with UIDAI (Unique Identification Authority of India) at the Help Line Centers. Therefore it is mandatory for the candidate to attend for Certificate Verification. ➢ Candidate shall be an Indian National. ➢ Candidate should belong to the State of Telangana /Andhra Pradesh as defined in G.O.(P).No. 646, Education (w) Dept., dated 10-07-1979 and its subsequent amendments. ➢ In respect of under Graduate Professional Courses in Engineering (including Technology ) and Pharmacy the candidate should have completed 16 years of age as on 31-12-2019. ➢ In respect of Pharm D (Doctor of Pharmacy) Course the candidate should have completed 17 years of age as on 31-12-2019. ➢ However maximum eligible age for obtaining a scholarship is 25 years for OC candidates and 29 years for other candidates as on 01-07-2019 as per the guidelines prescribed in Memo No. 10537/SW(Edn.2)/2011,dated: 20-10-2012 and further guidelines issued from time to time by Social Welfare (Edn.) Department shall apply. ➢ Mere appearing for TSEAMCET-2019 and obtaining a rank does not entitle a candidate to be considered for admission automatically unless the candidate fulfils the requirements laid down for admissions. • The candidates who did not pay processing fee during first and second phases of counselling has to pay now. ➢ Registration Number given on TSEAMCET-2019 Hall Ticket. ➢ Date of Birth as mentioned in the SSC Marks Memo. ➢ Hall Ticket Number of Intermediate or its equivalent. • The Basic Information Form is displayed and fill in the details regarding, Mobile No and Email Address. Also fill the details of Caste Certificate and Income Certificate application Number issued by MeeSeva, if applicable. • Update the information and pay the Processing Fee of Rs. 600/- (for SC/ST) and Rs. 1200/- (for others) through online payment (Credit Card / Debit Card / Net Banking) before attending for the Certificate Verification. Without payment of Processing Fee, the candidate is not permitted to attend for Certificate Verification. • Take the printout of Manual Option Entry Form from the website. • Consult Parents / Experts and prepare Manual Option Entry Form as per your preference duly writing institution code, branch code and district code. This is for your convenience and to avoid mistakes and save time while entering web options. • The Tuition Fee particulars and seats available under Convenor Quota college wise will be made available on the website https://tseamcet.nic.in well before the commencement of option entry. • The Fee reimbursement for eligible candidates is subject to the guidelines issued by the Government from time to time. ➢ TSEAMCET -2019 Rank Card. ➢ TSEAMCET -2019 Hall Ticket. ➢ S.S.C or its equivalent Marks memo. ➢ VI to Intermediate or its Equivalent Study Certificates. ➢ Income Certificate issued on or after 01-01-2019 by competent authority, if applicable. ➢ Caste Certificate issued by competent authority, if applicable. ➢ Residence Certificate of candidate for a period of 7 years preceding to qualifying examination in case where the candidate has no institutionalized education. ➢ In respect of Non-Local candidates to consider them for allotment under unreserved seats the following certificates needs to be submitted. • Residence Certificate: Candidates who has resided in the State for a total period of 10 years excluding periods of study outside the State ; or either of whose parents have resided in the State for a total period of 10 years excluding periods of employment outside the State. • Employer Certificate : Candidates who are children of parents who are in the employment of this State or Central Government, Public Sector Corporations, local bodies , Universities and other similar Quasi Public Institutions within the State at the time of applying for TSEAMCET -2019 Examination. ➢ Read the Instructions to candidates placed in the website https://tseamcet.nic.in for user manual. ➢ The candidates can exercise options from Home / Internet Centre / HLC. ➢ If the candidate is exercising options from Internet Centre make sure that proper logout is done after saving the options to avoid manipulation of the password by the Internet Centre person. ➢ Generate the Password by clicking on Candidates Registration link in the website. ➢ Do not share the password with others. ➢ After successful password generation, Login with the details under the link Candidates Login and enter OTP as received onto registered Mobile Number after Login. ➢ Refer the Manual Option Entry Form prepared by you and enter the options in the website. ➢ Candidates are advised to exercise options carefully in the order of priority. The order of priority of options is the important criteria in securing the seat. ➢ Candidate has to exercise as many options as possible to avoid disappointment of not getting a seat. ➢ Candidates / Parents are advised to exercise as many number of options as possible to avoid disappointment in not getting a seat, while exercising the options every care need to be taken in selecting the college and Branch as per the choice of the candidates. ➢ Candidate can exercise and modify the options any number of times within the scheduled dates. ➢ Take a printout of final options saved for reference.